Looking to encourage confident young readers in God's word? This epic Comicbook Bible brings the stories of the Bible to new life. Over 150 of the most epic stories of the Bible are retold in a dramatic art style. Do you know the true heroes of the Bible? Dive into the action and adventure of the Bible! BibleForce retells the Scriptures using stunning art and a fast-paced narrative that children can understand. Following the events of the Bible in chronological order, the simple, straight-forward retelling of the scripture will keep children totally captivated .You and your child can read about Bible heroes together, and the text is simple enough for young ones to read on their own. Includes over 150 of the most epic stories in the Bible, retold in a dramatic art style which brings characters to life. Hero profiles for key characters help children deepen their understanding and maps and a timeline help set the scene for the stories. Access to a free app is also included to help engage children in the epic story of the Bible. Bibleforce by Media Authentic was published by Authentic in March 2018 and is our 41571st best seller. The ISBN for Bibleforce is 9781788930048. 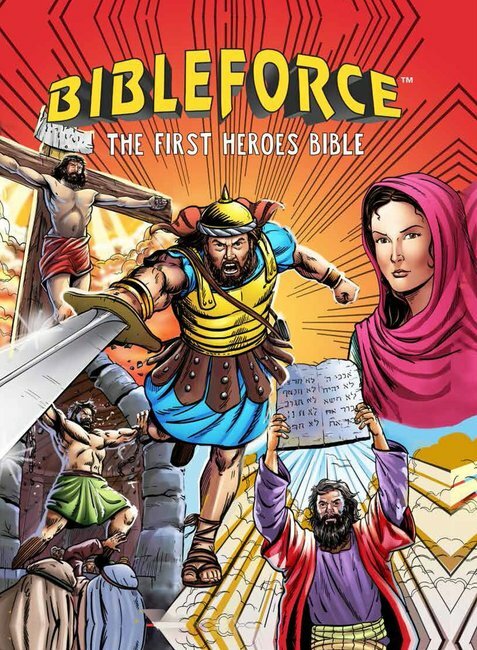 Be the first to review Bibleforce! Got a question? No problem! Just click here to ask us about Bibleforce.